Beautiful brown bodies bouncing on the beach (how’s that for alliteration!) may be one of Brazil’s most memorable features. But after all that people watching, you’re bound to get hungry, thirsty and ready for fun. That’s where the other memorable features, the famous national drink caipirinha and the endless rodizio barbecued meats served up at a churrascaria. 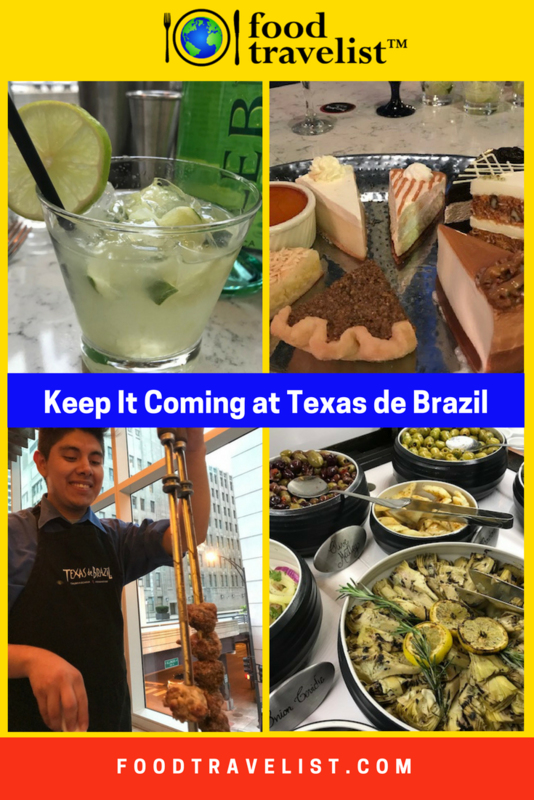 While we can’t guarantee the bountiful beach bodies here in Chicago, Texas de Brazil offers up some of the most delicious caipirinhas and rodizio barbecue in a fun and lively atmosphere that will satisfy even the hungriest of your friends and family. 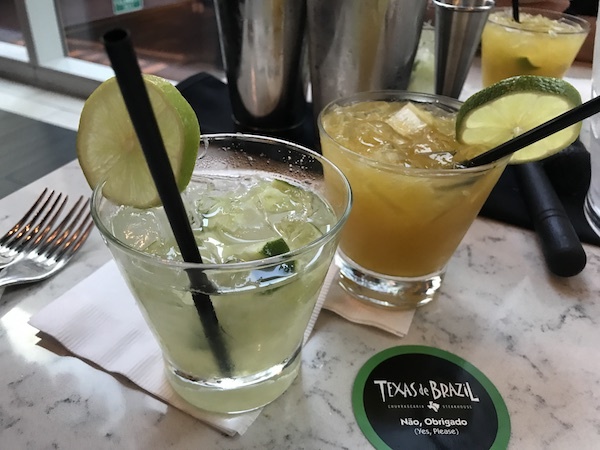 We want to thank Texas de Brazil for treating us to an evening of caipirinha-making lessons and full rodizio-style dinner. 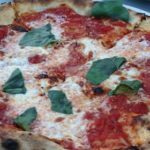 We received no financial compensation for this article and, as always, the opinions expressed are our own based on our experience. If you didn’t already know, Brazilians make their the national drink, the caipirinha, with a unique sugar cane spirit called cachaca. Brazilian cachaca is similar to its Caribbean cousin rum, except that rum is made with processed sugar cane juice known as molasses while cachaca uses fresh-pressed unprocessed sugar cane juice. This subtle difference ultimately makes cachaca the perfect spirit base for the lively caipirinha. 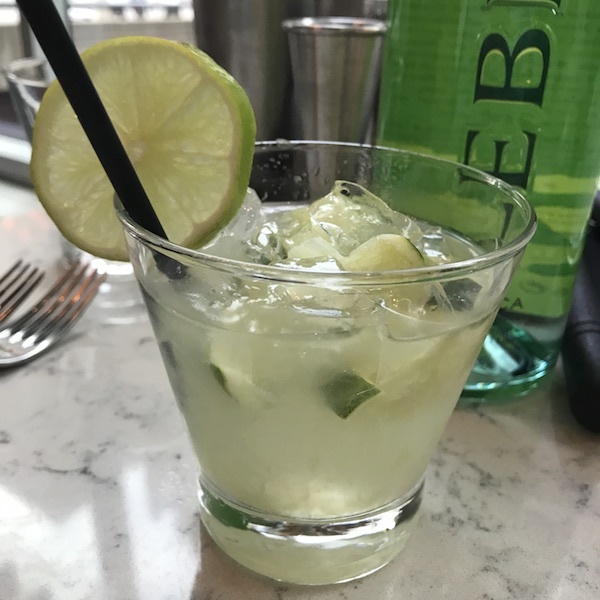 We loved learning how to make the Brazilian national drink at Texas de Brazil, where we got to use full bottles of Leblon cachaca, plenty of limes and sugar. We learned about muddling the limes and sugar together to get a juicy tart-sweet mix. And, we learned how to properly use the cocktail shaker in order to let some of the plentiful ice melt into the drink and provide just a touch of moderation to the delicious libation. For our second rendition, we had the opportunity to add some passion fruit or strawberry puree. The addition of pure fruitiness was just enough to make a completely different but equally refreshing and delightful taste. It’s easy to see why the caipirinha is a favorite cocktail not only among the Brazilians themselves but avid Food Travelists who seek out the best of the tastes of travel. Salads and Starters and Sides, Oh My! Once we quenched our thirst, we made our way over to the plentiful salad and appetizer bar. At Texas de Brazil in Chicago, the choices are wide and varied. 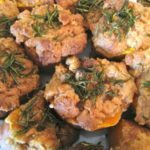 There are salads, soups, vegetables and side dishes galore. 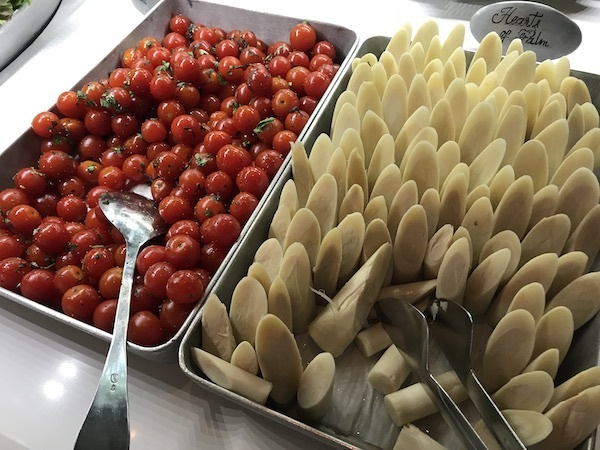 One of our favorites is the very traditional display of hearts of palm, a classic Brazilian treat. Cheeses, charcuterie meats, salmon, asparagus, mushrooms, shrimp salad, mixed greens, potato salad, and many more items make a beautiful display which diners can walk around to select their choices. Also available are traditional warm items such as feijoada (black beans), jasmine rice and soup. 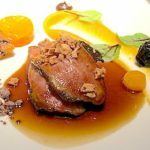 For those not interested in the meat side of things, there are more than enough choices here to fill you up completely. There are also some warm side dishes that come with a meal at Texas de Brazil. 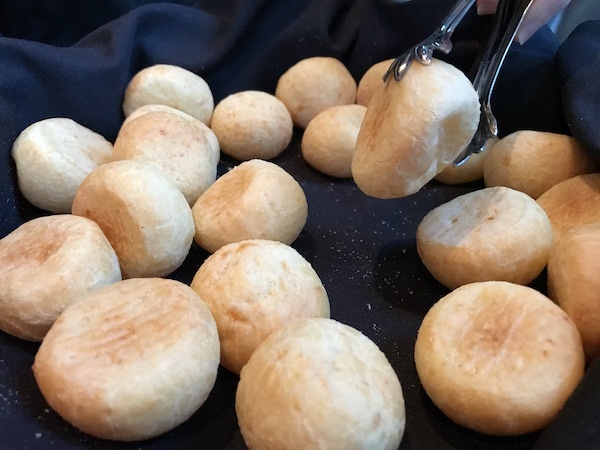 Everyone gets the delicious pao de queijo, or as we like to call them, yummy little cheese breads. Made with tapioca flour instead of wheat, these delicious little chewy puffs of joy are great for those who have are wheat intolerant. Other sides include garlic mashed potatoes and sweet fried bananas. 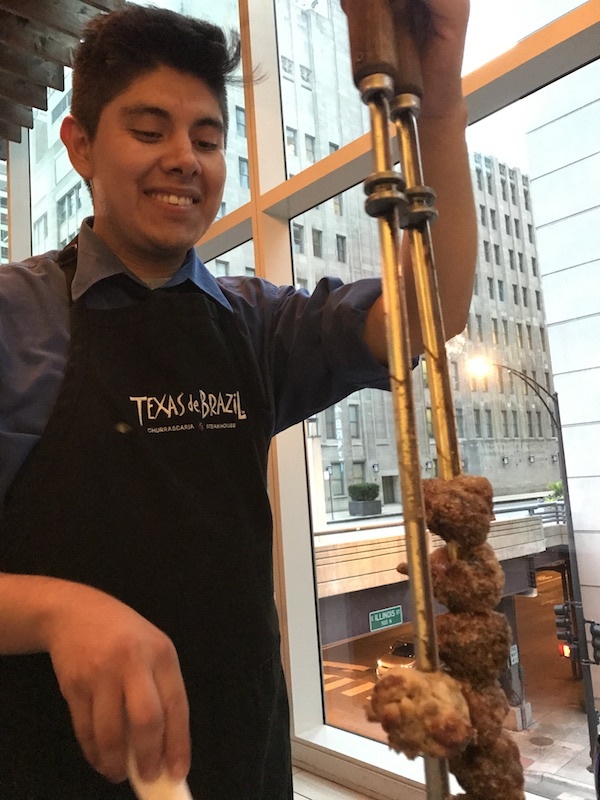 If meat is your game, Texas de Brazil has everything and more to satisfy you in a serious way. If you don’t know, the rodizio style of service means that they just keep bringing grilled meats around until you tell them to stop. And, you can tell them to start again too. Then stop again. Then start again. You get the idea. Texas de Brazil provides each meat-eating diner with a little disk that is red on one side and green on the other. Green means go, bring on the meat. Red means stop until I’m green again or when I’ve had my fill. The servers are all smiles and happy enough to meet you as many times as you want. No need to be bashful here – they aim to please. 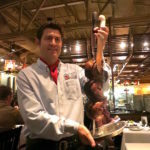 Texas de Brazil is first and foremost a steakhouse. With 16 cuts of perfectly slow roasted and seasoned meat, it’s really hard to each just a little. Bring your stretchy pants just to be safe. You’ll discover so many options from filet mignon, beef ribs, lamb chops, pork ribs, Brazilian sausage, flank steak, parmesan crusted pork loin, alcatra (top sirloin), chicken breast and more. But the Brazilian Picanha really stole our hearts. Picanha is a tender and flavorful top sirloin that is the specialty of the house. It’s so good that we honestly kept flipping our disks to green whenever we saw a “Gaucho” server with picanha on the skewer, even if we were otherwise way in the red. And if you manage to save room for dessert, Texas de Brazil has plenty of options. 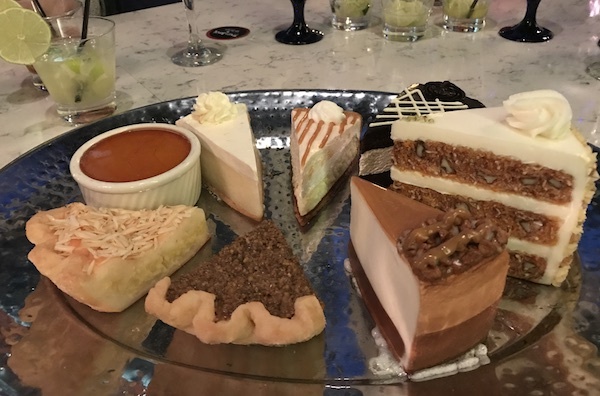 From traditional Brazilian flan and papaya cream to traditional steakhouse favorites like carrot cake, creme brûlée and pecan pie, there’s no reason your sweet tooth should go hungry either. We thoroughly enjoyed the attentive service, lively atmosphere and delicious food and drink of Texas de Brazil. 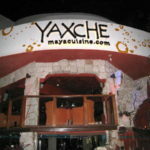 It’s a fun place to go with a group of friends or family where everyone can get what they want. Just be sure that you go hungry. There’s really a lot of options to try and you wouldn’t want to slight your visit by not having enough of an appetite. Go hungry, leave happy. That pretty much sums up how we feel about Texas de Brazil. If you want to check out more of what they have to offer and to find the location nearest to you, visit the Texas de Brazil website. Oh my gosh! 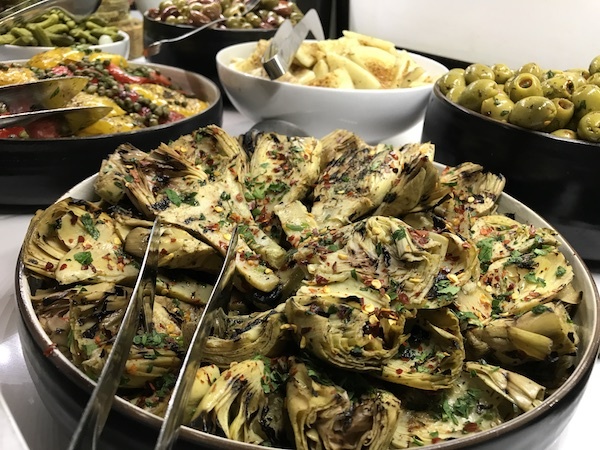 I’m really not the biggest fan of artichokes but that looks so amazing! Wow! The meat looks so tender and beautiful! Yum! I’ve never eaten at a Texas de Brazil even though there was one in a town where I used to live. My husband really likes this type of restaurant. After reading your post and looking at the tasty pictures, I think I should give it a try! Yum! It’s definitely a spot for guys who love to eat meat! Hope you get to try it soon. I have never tried yet Texas de Brazil and looks like such an interesting place to visit. I just learned about Caipirinha, as Brazil’s National Drink. But most especially I would definitely go for the sweets! Texas de Brazil looks yummy. I would love to try the little cheesy bites. In the Caribbean, our rums are made out of sugar cane. I think Brazil just moved up on my bucket list! I thought that the food looked delicious, and then I saw the desserts. All of the food looks delicious! I wouldn’t know where to begin if I were dining here. I didn’t know Brazil’s national drink is made of sugar cane! I would love to try it but it’s not a regular item on the menu in local restaurants. If we can make it ourselves at home, that’d be nice. Brazillian flan is also interesting.